You remember that person you were, right? You finished up your educator preparation program and honed your belief statement as a teacher. You were bright eyed and ready to take on anything education was going to throw at you. You wanted to meet the needs of ALL students - those who struggle, those who soar… Your hope was to affect change for ALL students learning in your classroom. So, are you doing what you set out to do? How do you know? Are you getting better at it? How can you measure that? Being an effective educator in the 21st century is complex, and challenging, and requires constant self-evaluation. 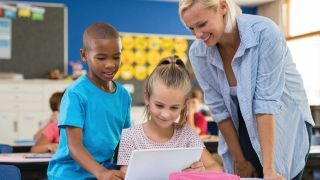 Luckily, there are many ways technology can help teachers see themselves and their practice more clearly. Record yourself during the presentation of a lesson. Record from the BACK of the room for a different perspective. What data are you looking for? The options are endless! Percentage of Teacher vs. Student talk; number of movement breaks; how many students come and go from the room; percentage of on-task behavior; your tone of voice; your rate of speech; how varied your questions are; who you call on and how? What’s your average wait time? How much are you on stage as opposed to guiding from the side? Have fun with it - this data is for YOU! Tech-powered survey tools are easy for you to design and for others to answer. I used to send home surveys to families using SurveyMonkey, but Google Forms and other tools can do a great job as well. Asking consistent questions over time allowed me to see trends, growth, and opportunities for more growth. I wanted to know what families thought about our classroom culture, our unique homework policy, my communication skills, their child’s comfort level, the level of rigor, and the quality of feedback I gave on student performance. Some questions were very difficult for me to ask because I had less confidence in my skills, but I needed to know the answers. The results from these surveys changed the culture of teaching and learning in our classroom for the better. I halted some practices and expanded others. The bonus was the fact families loved being asked! A Report Card for Me! There are so many ways to gain a clearer view of what we’re doing as teachers (and leaders). A favorite of mine was a “Report Card for my Teacher.” Students would anonymously “grade” me (either digitally or on paper). The only requirement was having to fill out ALL of the comment boxes, as I told them that’s where the learning opportunities were. I did this several times a year while I was a teacher, and the results (especially over time) were always worth reading. Why? Because, thankfully my students were honest! I received low scores on giving students grades they “earned” so I worked harder on rubrics and expectations and models and feedback. The one I took to heart the most was whether I knew what was going on in the room. Teaching (and leading) takes SUPERHUMAN vigilance. We need bigger ears and more eyes. But, students were sharing how sometimes I missed things during unstructured times. I could not have students think the adult in the room was unaware of everything going on, so I worked hard to change that. I am proud (and EXHAUSTED) to say my scores improved significantly over time, but that improvement only came with the stark realization of just how aware we have to be. And I thought I already knew that. I did not. Blogging/Website platforms - Any one of them will give you a chance to share your voice and ideas along with your insight. Whether a Google Site, WordPress, Wix or Weebly, you can’t go wrong. Start small and your posts will grow. Podcasting - Once again, there are many tools you can use to share recordings online. My latest favorite is the Lookwide app -- a micro-broadcasting tool where you can easily and frequently share short audio clips straight from your phone. YouTube/Video - Sit down in front of your camera and create a reflective video (or a series of them!) on a topic you are seeking to improve. Share with co-workers, families, friends, or your PLN and ask viewers to share insight and add their own experience to the conversation. Your professional learning community can be a HUGE resource when you are seeking feedback and clarity in your reflections. Reach out and connect with those around you to ask for support and advice. I even consider my mom part of my PLN. She volunteered in my classroom for 10 years and saw things I could not. She was EXCELLENT at giving feedback. Whether you are emailing, texting, Snapping, Tweeting, Podcasting, Facebooking, Instagramming or Starbucking, you are networking socially to broaden your perspective. The only wrong way to do it is not to do it at all. Who holds your mirror? Your students? Their families? Your co-workers? Your administrators? Do you see what you want to see, or do you see what they see? Where in the blur between do you assure your better intentions are being actualized? Over the years, my students have changed. They are the teachers in my district. They are my workshop attendees. They are all of you. Am I honestly reflecting on who I am with them? Am I meeting all of their needs? The feedback I solicit and read after workshops, presentations, trainings and articles matters significantly. I take notes for future courses and try my best to see all comments as an opportunity to grow. I record my presentations and watch them back, looking for areas of improvement... Did I describe things clearly... Was I aware of what was going on in the room? I want to see my efforts reflected in those surveys; in those recordings. And if they are not, then I must bravely consider what those mirrors show me. As professionals who came into this field with our eyes bright and hopes high, I know we can be fearlessly reflective and bravely strengthen our skills towards better and better practices together. After 10 years as an elementary teacher, Suzy Brooks is the Director of Instructional Technology for Mashpee Public Schools in Massachusetts. Additionally, she provides professional development and hands-on workshops for educators at local, regional and national venues. Her work in blended learning, student engagement, and social media has been featured by EdWeek, NBC News’ Education Nation, Instructor Magazine, Intel, ISTE, ASCD, and the NEA. Currently, Suzy is a visiting lecturer at Fitchburg State University, a MassCUE Pathfinder and the Massachusetts ASCD President. Suzy holds a B.S. from Bridgewater State University and a M.Ed. in Instructional Technology from Lesley University.